Elite Folding Rocker will give you hours of campsite comfort. Midnight blue fabric against gun metal gray frame makes this a rocker you will want to own. 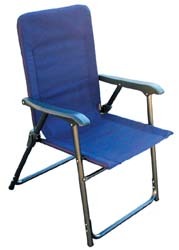 Designed for comfort by eliminating cross bar that typically goes across the front of most folding chairs. 250 lbs capacity. California Blue. 35” H x 28” D x 23” W.